Exciting news about the northernmost wild jaguar population has come in from the field. Woodland Park Zoo-supported jaguar conservation biologists report in that they have seen signs that these threatened cats are pairing up, which means they could be mating and there could be cubs in the near future—a sign of hope for this threatened species. A little background on Woodland Park Zoo's jaguar conservation efforts: Thanks to a generous bequest, the Field Conservation department has been able to fund jaguar conservation projects for the past 10 years at the rate of $10,000 a year. 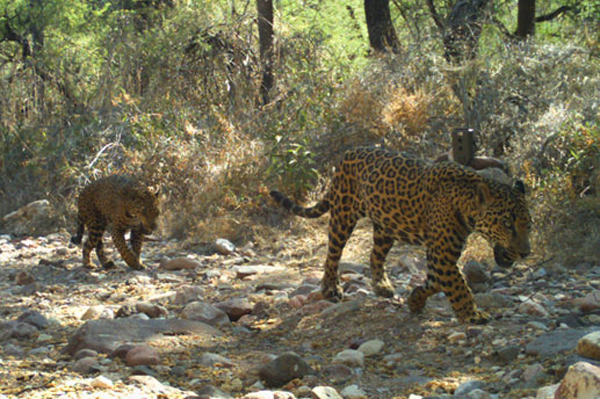 This year, one of the recipients was the Northern Jaguar Project, based in Arizona but working with ranchers in the area near Sonora, Mexico—just 125 miles south of the U.S.- Mexico border. There, an estimated 80 to 120 jaguars remain in a 1,500 square mile area. The Project focuses on involving ranchers with land adjacent to the 50,000-acre Northern Jaguar Reserve in conservation and habitat restoration. Ranchers have agreed to allow the placement of cameras on their land in corridors that jaguars are known to use. For each photo the cameras take of bobcats, mountain lions, ocelots and jaguars, the rancher is paid a modest stipend. This encourages the ranch owners to allow the cats to travel their corridors freely, rather than choose to eliminate the perceived threat. The following is an update from the field by jaguar guardians Carmina Gutiérrez and Miguel Gómez Ramírez. The video and photographs you’ll see come directly from the field and offer up a rare glimpse into the world of the northern jaguar. In the last several months, we have seen camera trap photographs of four new jaguars on the Northern Jaguar Reserve. These are: “Pecosa,” “Sei,” “Libélula,” and “Mágico.” (We selected these names from suggestions made by NJP supporters and donors.) Pecosa, Sei, and Libélula appeared at Dubaral in December, January, and April, respectively. Pecosa and Libélula are both female, and we are not yet sure about Sei’s gender because the photo is not very clear. Mágico was photographed at Babisal in May; we do not know this jaguar’s gender yet either. Remote camera images of jaguars. Left to right: Mágico, Sei, and Pecosa. Photos courtesy Northern Jaguar Project. In addition to these new jaguars, we have seen many pictures of “El Inmenso” and “Ferb.” Both males have been wandering throughout the reserve and on neighboring ranches to the south. 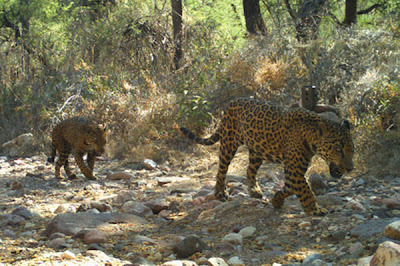 The female jaguars “Caza” and “Corazón” have also been active in recent months. Ferb has been moving regularly between the reserve and ranches, yet in our last check of the cameras; he wasn’t recorded on the ranches at all. We knew the reason as soon as we saw the pictures from the cameras on the reserve. Ferb appears accompanied by a female! Yes, he was with Libélula! They were together several times over a period of four days. We were thrilled to get some video clips of them while they were walking together. Adult jaguars generally live alone, except in mating season when males move with females in estrus – or heat. So it is possible that this couple was mating and, if all goes well, another new jaguar will be born at the end of summer. Remember, we’ve seen that Corazón and Caza are possibly mothers right now as well! You can see the latest photos here. We are so happy with all of this good news, aren’t you? Let’s get out there and continue supporting the conservation and study of northern jaguars! Our jaguar guardians, Carmina Gutiérrez and Miguel Gómez Ramírez, have worked at the Northern Jaguar Reserve since October 2008. As the reserve’s resident biologists, Carmina and Miguel patrol lands to keep out poachers, maintain a network of motion-triggered cameras, and inventory the ecological health of reserve lands and waters. This blog post is based on a story originally posted by the Northern Jaguar Project.